We came across these chips while picking up some stuff at the grocery store. We are big fans of gyros, so when we saw a gyros flavored chip, we knew what needed to be done. The trouble is, we don’t know where to put this review. Is it limited time only? Not sure, because we don’t know which chip will win the contest. So, we’ll just call it a Fewd Bite. 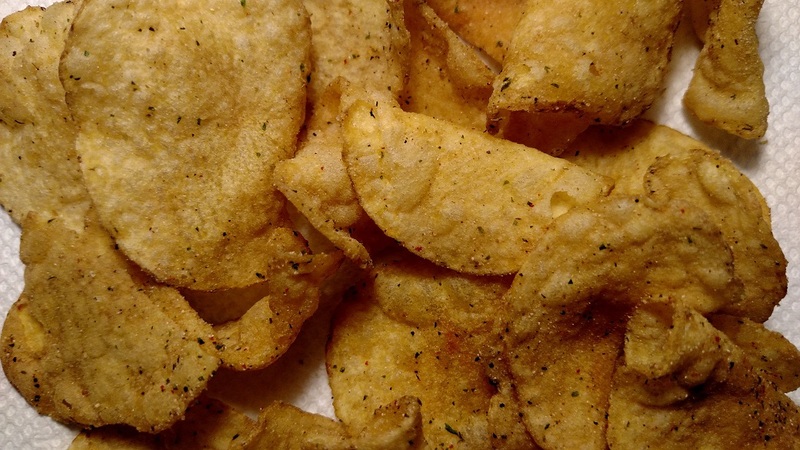 These chips were born from the Frito Lay contest for a new chip flavor. The contest is titled, “Do Us A Flavor.” There are four finalists. Check out all of the flavors here. 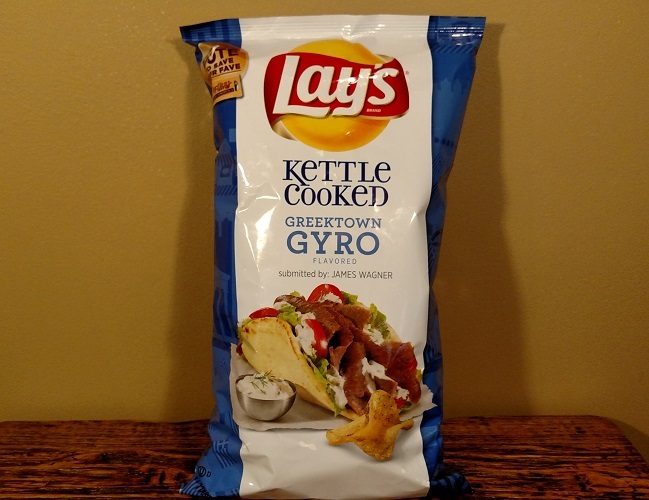 The gyros flavored chip is of the “Kettle Cooked” variety of Lay’s chips. We liked that, because the kettle chips are crunchier than regular chips. Good start. You can clearly see the seasoning on the chips, yet it isn’t caked on so heavily that it is gross. The chips are nice and crunchy, just like all the other “Kettle Cooked” Lay’s chips are. Now, on to the biggest part. The flavor. Herman’s Thoughts: Well, here we have a pretty wild flavor I would say. I was actually pretty excited to try these. I am newly introduced to the world that is “gyros,” and have to say that they have quickly become a favorite menu item. The only problem is finding them. The central Midwest isn’t exactly overflowing with gyros stands. But anyway, I was still quite optimistic, so I reached for a handful. My first reaction is that there isn’t a ton of seasoning, meaning that it wasn’t caked on. It was just that, a seasoning. The other thing I noticed right off the bat was the smell. These chips actually smell like gyros, which I thought was pretty cool. With that, I didn’t really get much more gyros flavor than the initial smell. I guess this could be a good thing. I honestly wonder if anyone in there right mind would want a chip that tastes like cooked meat. After the smell, the next thing that hit me was the flavor of tzatziki. This, too, is expected as gyros really isn’t gyros without it. The flavor, again, was not too strong. Just a quick hit of cucumber, dill, and sour cream. Not bad. Overall, I think these chips are pretty good. They definitely remind me of gyros. And since I don’t get a real gyros very often, I’m okay with that. The only negative thing I would say is these really are not your everyday potato chip. I could see myself eating a few at a time, then closing the bag til next time; unlike a normal bag, which I could probably take out in one sitting. So yeah, I approve and would probably try the other flavors as well. Denny’s Thoughts: To me, the flavor of these chips is virtually impossible to explain. I guess I would say the initial flavor doesn’t taste like gyros. But then, suddenly, the taste shifts. At that point, unlike Herman, I actually do taste gyros meat. Then, the tzatziki takes over. Overall, I would say that I do taste a gyros sandwich. The flavor builds, though. It is a subtle flavor. It doesn’t blow you away. I think that is a good thing. It isn’t so strong that it is inedible. The weirdest part about this chip, while strange and maybe a little gross, is something I have to say. When eating these, when I breathe out through my nose, I can really taste the gyros! What the hell??? I don’t know! It’s bizarre! But that is when I taste it the most! Here is the biggest thing that I can say, and it doesn’t make sense. I like the flavor well enough, but I only want a few at a time. The flavor tastes like gyros, but a gyros flavored potato chip? Really? Like other flavored chips we have reviewed, what are you supposed to eat these with? The flavor is too unique to pair these chips with a regular sandwich. So, they should be eaten on their own, I guess. But it is a strange enough flavor that I only want a few at a time. As a result, I doubt I would ever buy these again. Herman mentioned this in his blurb, but it warrants repeating. To us, these are like novelty chips. These are not going to be eaten like regular chips. What’s a regular chip? For us, that would be “normal” flavors. You know, the standards like BBQ, sour cream and onion, PLAIN, and so on. That’s a potato chip. These crazy flavors just can’t be eaten in mass quantities. And they can’t be eaten as a side. They just aren’t normal chips! We suspect the real point here is to draw attention to Lay’s chips with the contest. Overall, we like these chips. But, they aren’t “chips” to us, if that makes sense. Still though, we think they are worth a try. Vomit Chips! You might be on to something, there. You better watch it; if Frito Lay sees this, that might be the next new flavor! Blech!